The U of T Grant application is available for students who are experiencing financial difficulties due to circumstances beyond their control. Before applying, you are expected to have applied to all other sources of funding that are available to you (e.g. OSAP or other government aid, family assistance, savings, etc.). If you belong to a division that is not in this list, you will need to fill out a paper copy of the application available on your division’s website. 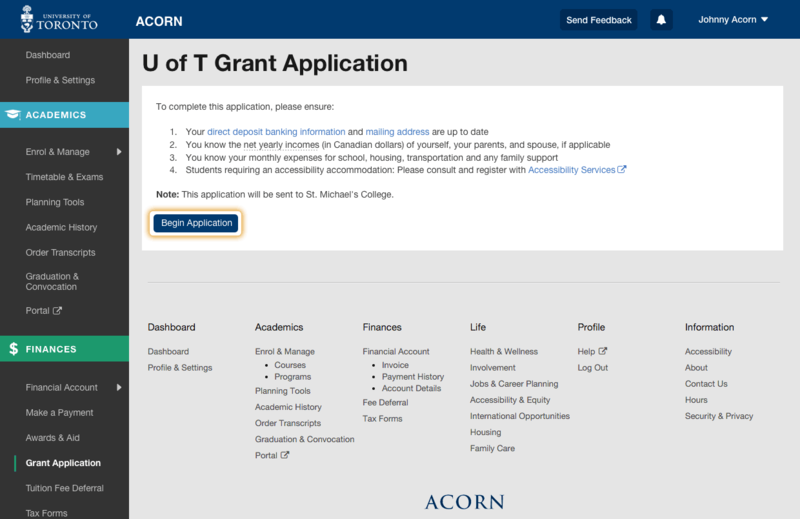 To access the online U of T Grant Application, go to the “Grant Application” page via ACORN’s left navigation. The introductory information explains everything you will need to complete the application. Please ensure you have these on hand. If you are associated with more than one faculty at U of T, select the faculty you wish to send the application to. 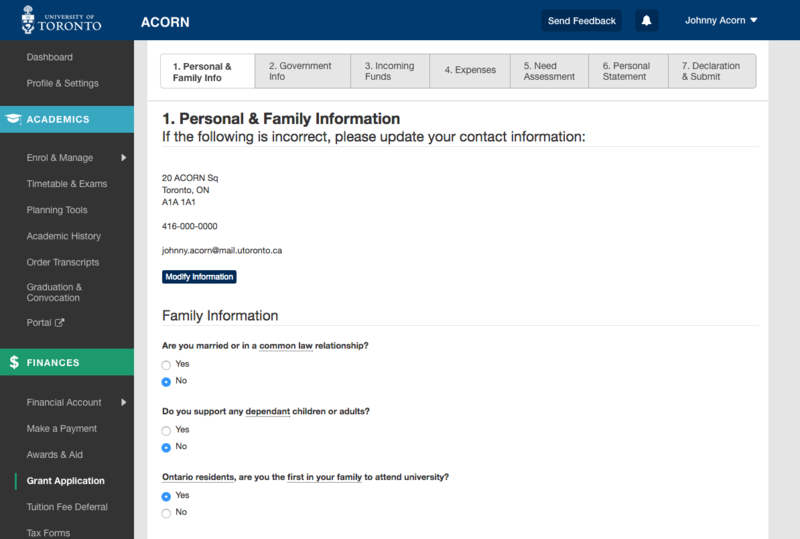 Personal & Family Info: Please verify that the contact information displayed is correct and fill out your personal information for this section of the form. 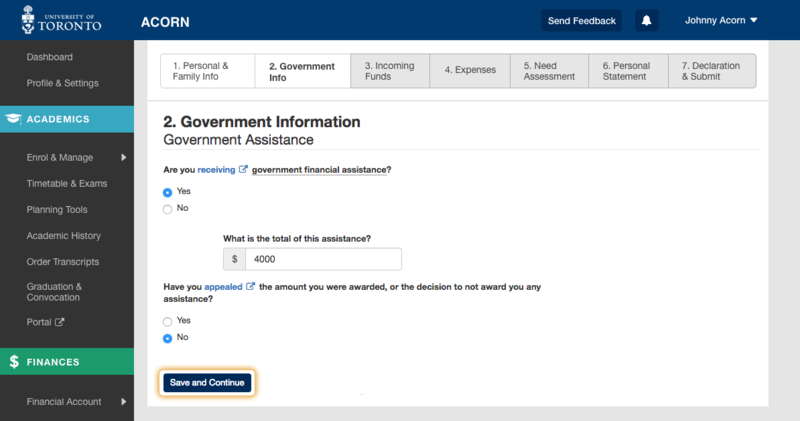 Government Info: In this section, indicate whether you are receiving government financial assistance and how much. 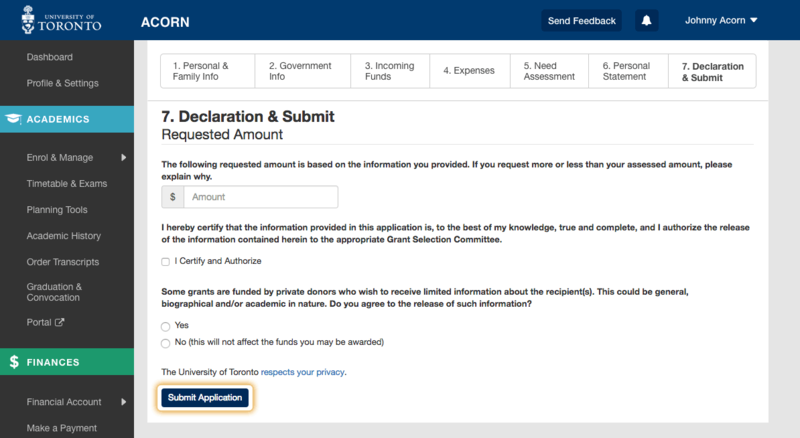 Note: If you have applied for government financial assistance and have not received enough, you should appeal the decision by speaking to Enrolment Services before applying for the U of T Grant Application. Incoming Funds: This section concerns funds you have received through awards, savings, employment at the university or elsewhere, family financial support and any other sources of income you may have. Note: If you have or plan to apply for OSAP, you are expected to contribute $3,000 per school year towards education costs in order to receive the New Ontario Student Grant. 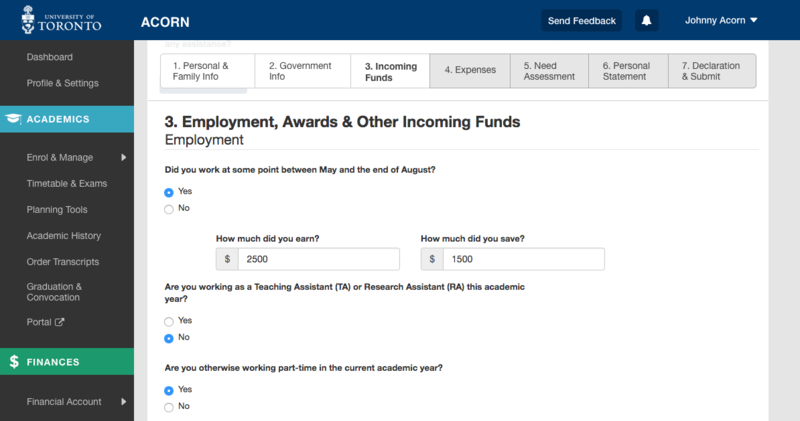 Once you have filled out this section, you will see a summarized total of all your income for the Fall-Winter session. 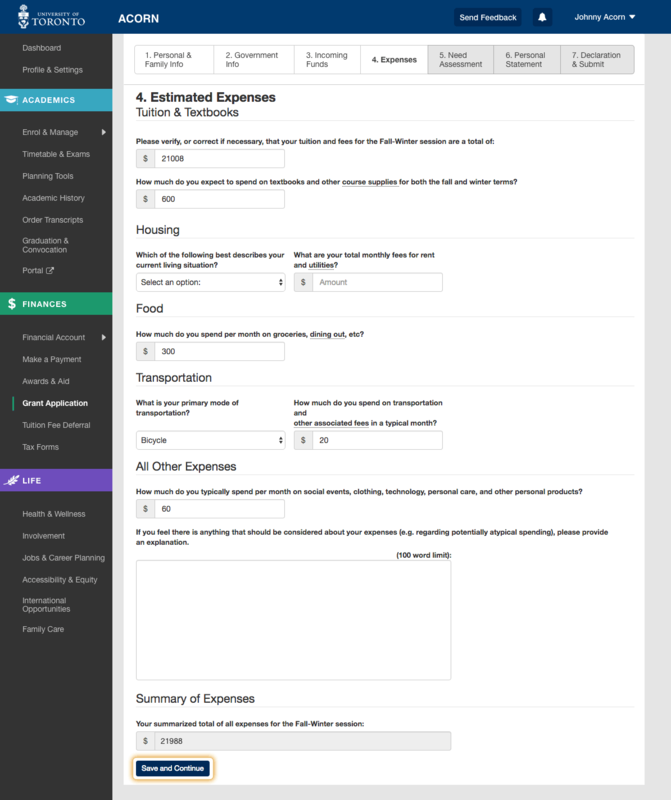 Expenses: In this section, your tuition will be calculated for you based on your registration information. For other expenses like housing, food, transportation and miscellaneous costs, you will need to provide these numbers. If you have any further information about your financial situation that you want the Grant Selection Committee to know, you may provide an explanation in the text box under “All Other Expenses”. You will also be shown a summarized total of your expenses for the session. Need Assessment: This is a summary of how much financial need you require for the term. This summary is one of the many things that the issuers of the Grant Application will consider when making a decision. It does not mean you are guaranteed to receive funds. Personal Statement: For your Personal Statement, provide an explanation of how you initially planned to finance your studies at the beginning of the year, what changed that plan and why you need financial assistance. 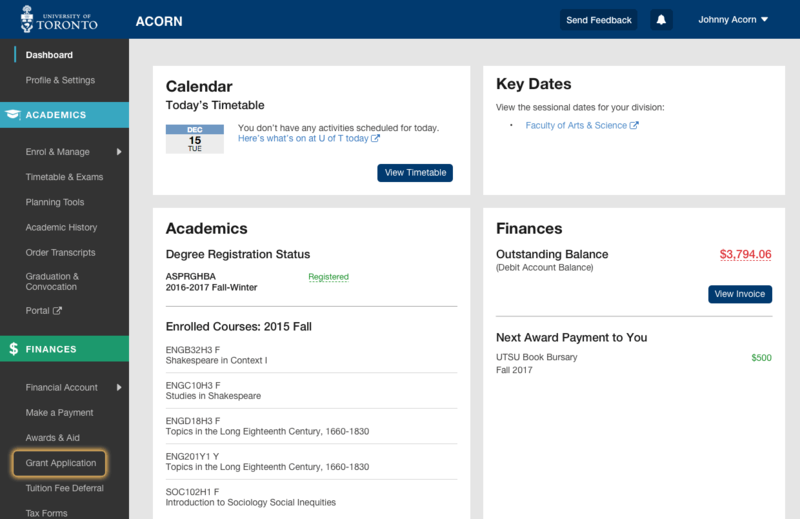 Declaration & Submit: On your declaration page, provide the amount of assistance you are requesting from the University. Certify that the information you provided in the application is valid and authorize the release of the information to the appropriate Grant Selection Committee. Application Submitted: Your application has been successfully submitted to your faculty, and you will hear back from them soon. If you need further assistance, contact your financial counsellor.